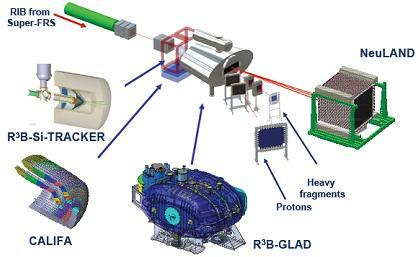 The experimental setup for studies of reactions with relativistic radioactive beams R3B is part of the FAIR project. The aim of the R3B international collaboration is to develop and construct a versatile reaction setup with high efficiency, acceptance, and resolution for kinematically complete measurements of reactions with high-energy radioactive beams. The setup will be located at the focal plane of the high-energy branch of the Super-FRS. The experimental configuration is based on a concept similar to the existing R3B/LAND reaction setup at GSI introducing substantial improvement with respect to resolution and an extended detection scheme, which comprises the additional detection of light (target-like) recoil particles and a high-resolution fragment spectrometer. The setup is adapted to the highest beam energies (corresponding to 20 Tm magnetic rigidity) provided by the Super-FRS capitalizing on the highest possible transmission of secondary beams. The R3B setup will cover experimental reaction studies with exotic nuclei far off stability, thus enabling a broad physics programme with rare-isotope beams with emphasis on nuclear structure and dynamics. Astrophysical aspects and technical applications are also concerned. In order to cover such a large physics programme several different detection subsystems as well as sophisticated DAQ system and data-analysis softwareare planned (see below). The work is performed inside the R3B collaboration which includes more than 50 different institutes from all over the world. NeuLAND (new Large-Area Neutron Detector) is the next-generation neutron detector designed for R3B which meets all requirements defined by the ambitious physics program proposed for the R3B facility. NeuLAND features a high detection efficiency, a high resolution, and a large multi-neutron-hit resolving power. This is achieved by a highly granular design of plastic scintillators, avoiding insensitive converter material. The detector will consist of 3000 individual submodules with a size of 5x5x250 cm3, arranged in 30 double planes with 100 submodules providing an active face size of 250x250 cm2 and a total depth of 3 m. NeuLAND can be divided into two detectors for special applications and will be placed at different distances from the target, in order to meet specific experimental demands. A momentum resolution of Δp/p of 10-3 similar to that for the charged particles is desired, resulting in resolution requirements for the time of flight of σ(t) < 150 ps and a position resolution of σ(x,y,z) ≈ 1.5 cm for given flight paths in the range from 10 to 35 m. For an experiment on a medium mass nucleus at about 500 MeV/nucleon, invariant-mass resolutions of about ΔE =20 keV at 200 keV above the neutron threshold (ΔE=30 keV at 1 MeV respectively) will be reached using the maximum flight path. Apart from the excellent energy resolution of NeuLAND, the enhanced multi-neutron recognition capability with an efficiency of up to ~50% for a reconstructed five-neutron event at 1 GeV (see tabels below) will constitute a major step forward. Neutron separation matrices for multiplicities of 1 to 5 neutrons. The final design described in the NeuLAND Technical Report is the result of several years of R&D studies. Different design concepts have been followed, including converter-based solutions, e.g., a detector based on steel converter plus charged-particle detection with resistive-plate chambers (RPC). The RPC concept has been ruled out mainly because of its insufficient multi-neutron detection capability. A fully active detector with calorimetric properties has turned out to be the best solution. Submodules have already been tested with proton and electron beams resulting in time resolutions of better than the required σ(t) ≤ 150 ps, even with inexpensive photomultipliers. In accordance with simulations, improved timing properties have been obtained with optimized light guides. NeuLAND detector with frame arranged for moving double planes. Left: the front sides of both frames are put to minimum distance; Right: half of double planes have been moved to the second frame. The details of the technical realization including mechanics, readout electronics, tests, calibrations, as well as the construction procedure are summarized in the NeuLAND Technical Report, which was finalized in November 2011. The construction of the full detector will take about 3.5 years, and will be done in 3 steps. 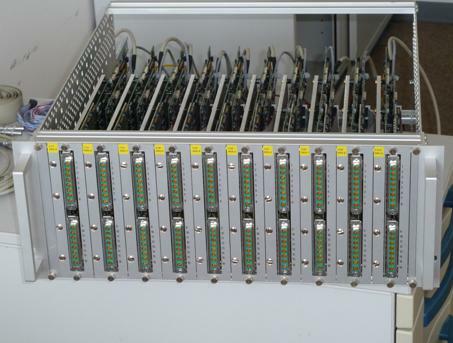 In the first step (November 2012), we will use a small assembly of 150 bars to determine time and position resolution with neutrons and validate simulation results. The neutrons of energies between 250 and 1500 MeV will be produced by proton knock-out reactions using a deuteron beam. In the second step, a 20% of detector will be available for physics experiments in the end of 2014 in Cave C at GSI, which will already profit from an improved resolution for neutron detection. The fully-equiped NeuLAND detector will be commissioned and available for the first experiments at Cave C in 2016. In 2017, the detector will move to its final location in the R3B hall at the FAIR site, being fully operational for physics experiments in 2018 when Super-FRS will deliver first beams at FAIR. For the variety of experiments to be performed within the R3B project, a zero-degree superconducting dipole magnet has been designed and constructed. The main parameters of the spectrometer are: (i) A large vertical gap providing an angular acceptance of ±80 mrad for neutrons; (ii) A maximum bending angle of 40°, ensuring an acceptance close to 100% even for experiments with very different magnetic rigidities of the beam and the fragments; (iii) A high field integral of about 5 Tm, which allows a bending angle of 18° for a 15 Tm beam (e.g. 1 GeV/nucleon 132Sn or 500 MeV/nucleon 8He) or 14° for 20 Tm beams, the maximum rigidity provided by the Super-FRS. A momentum resolution Δp/p of around 10-3 can be achieved by tracking the particles with high resolution (see below). The design includes four superconducting coils which are tilted to match the required acceptance angle for the particles of interest. The side coils are optimized to reduce the fringe field, and guarantee a low magnetic field in the target region, where detectors have to be placed. The magnet has been has been delivered in November 2015 to GSI. In February 2016 together with its large vacuum chamber the magnet has been moved into Cave C, where it will be used in experiments until the R3B experimental hall is built at the FAIR. Update on the GLAD status can be found here. Responsible: GSI and CEA Saclay. GLAD magnet – Left: technical drawing; Right: photo of the cold mass built at CEA Saclay. For some of the reactions to be studied the most interesting information is concentrated in the region of very low momentum transfer, and therefore demands for high resolution detection of very slow target-like recoil particles. A very promising solution to such experimental challenges is the use of an active target detector, where the gas constitutes both the target and the detection medium. Such a detector may have a very high efficiency, very low particle detection thresholds, and may use different gases, which can therefore be chosen to best suit the experiment purpose. The physics case addressed within R3B with the active target concept is quite similar to that of the EXL project, but the two different projects are well complementary. The EXL project will allow to reach high luminosities for all cases where the nuclear lifetime of the exotic beam particles is sufficiently long (> 500 ms) to allow for beam preparation in the CR/NESR rings and for continuous accumulation and stagging. Keeping in mind that the rate capability of the active target technique will be limited, especially for very heavy projectiles, to about 105 s–1 or less, luminosities of the order of 1028 cm–2 sec-1, as expected for EXL, will not be reachable with external active targets. On the other hand, there exist many cases of exotic beams of high interest for nuclear structure and nuclear astrophysics, which are located far outside the valley of stability, and consequently have half-lives much shorter than 1 s, and relatively low production rates considerably below 105 s–1. For such cases the technique of active targets is presently considered as the only way to perform high resolution experiments at low momentum transfer with sufficient luminosities to extract the cross sections of interest. The R3B active target detector is a relatively novel gas detector concept where the gas constitutes both the target and the detection medium. Mostly, inverse reactions will be used where the target gas is p, d, 3He or 4He, either pure or mixed with standard detection gases such as isobutane C4H10. The recoil particles have mostly very low energy for the most important centre of mass angles near zero degree in quasielastic reactions. The identification and good resolution of such low energy particles together with high efficiency is most uniquely realized in a gas detector. The working principle of such detectors as the one used at GSI, IKAR, and the one tested and used at Ganil, Maya, can be characterized as Charge Projection Chamber by analogy with the Time Projection Chambers (TPC) used in Particle Physics. For the tracking of light charged particles, i.e. protons, behind the R3B dipole magnet two identical drift chambers (DHC) are foreseen. Each DCH covers an active area of 100×80 cm2, thus providing a large enough acceptance behind the magnet to detect decay protons (matched to the geometrical acceptance given by the gap of the dipole magnet of ±80 mrad). The geometry and the operational parameters are optimized to detect minimum ionizing particles with an efficiency of larger than 95% and a spatial resolution of better than 0.2 mm (σ). The tracking through the dipole field provides a relative momentum resolution Δp/p~3×10-3 for the protons according to Monte-Carlo simulations (including detector resolution and the straggling in the detectors at a beam energy of 500 MeV/nucleon). Each DCH comprises 2 planes (x and y) placed in one housing with in total 250 read-out channels. The chambers will be operated with the gas mixture [Ar:C2H6] = [50:50] at 1 atm. In order to resolve many-particle ambiguities the two chambers will be inclined with respect to each other by ±10 deg. relative to x,y. In most cases experiments using exotic beams have to include a twofold setup for identifying particles and their kinematic properties before and after the secondary reaction target. For the large variety of different experiments proposed for the R3B setup, various tracking-detector systems with different demands are required. In most cases experiments using exotic beams have to include a twofold setup for identifying particles and their kinematic properties before and after the secondary reaction target. The incoming beam will be tracked (starting from the dispersive focus at the Super-FRS) in order to determine beam momentum, angle and position of incidence on the target, and, similarly, for the spectrometer after the target. The velocity of the incoming beam as well as of the fragments has to be determined with a resolution of Δβ/β<10-3 in order to achieve unique isotope identification after the target also for heavy beams. Using 40 m distance between the dispersive focus at the Super-FRS and the reaction target the requirements for time-of-flight (TOF) detectors are quite moderate (σ(t) < 100 ps) in this case. Also moderate position resolution of Δx=3 mm would be sufficient. The detectors should be able to cope with rates of 107 to 108 s-1 heavy ions at the dispersive focus of the Super-FRS. 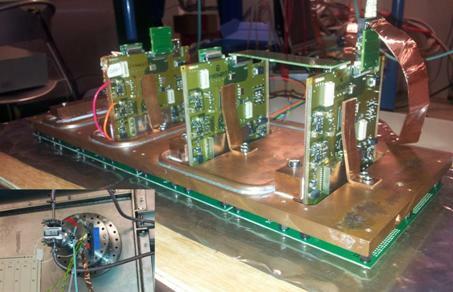 For the large-acceptance mode, large-area detectors are placed behind the R3B dipole magnet. For detection of light charged particles drift chambers with a size of about 1.2×0.8 m2 including dedicated front-end electronics are presently being considered, see section on proton tracking. For heavy ions, a position detector with the size of 30×20 cm2 is needed. For fission and spallation studies, even larger detectors are needed. Those are described in the section 'Large-area ToF wall'. The detector for light (target-like) particles is a substantial part of the R3B setup. It allows registration of recoils in coincidence with the heavy fragments, neutrons and the γ-rays. This set-up gives thus a unique possibility to study elastic, inelastic and quasi-free scattering, knockout and breakup reactions. The recoil particle detector provides precise tracking, vertex determination as well as energy and multiplicity measurement with high efficiency and acceptance. The latter two parameters are very important when dealing with radioactive beams. According to previous experience, for the case of (in)elastic scattering, the angular resolution (in centre-of-mass and laboratory system) should be around a few mrad and the resolution in excitation energy, E*, better than 1 MeV. Total absorption efficiency: 80% (up to Eγ=15 MeV Lab system). γ sum energy: σ(Esum)/<Esum> < 10%. γ energy resolution: ΔE/E = 3-5 %. LCP energy resolution: ΔEp/Ep < 3%. Spin-isospin giant resonances can be strongly excited in (p,n) reaction using inverse kinematics. One can use at the same time thick targets, without disturbing the energy spectrum of the recoiled neutrons, which has an importance in experiments with rare isotope beams. For such type of studies, a low-energy neutron detector around secondary target is needed. The energy of the neutrons will be measured with resolution better than 10 % and the scattering angle in laboratory frame with better than 1° angular resolution. We require also high efficiency for the spectrometer. The best candidate for such a setup is a time-of-flight (TOF) ball consisting of plastic scintillators. The tracking of heavy ion trajectories through the magnetic field of the large-acceptance dipole provides a Bρ measurement with a precision of ΔBρ/Bρ~10-3 (sigma), as discussed above. In conjunction with energy-loss and time-of-flight measurements fragments are uniquely identified also in case of heavy nuclei. On the contrary, for a precise measurement of the momentum of recoiling fragments produced in reactions an additional momentum analysis is required. In case of high beam energies and medium-heavy to heavy nuclei a precision of the momentum measurement Δp/p in the order of 10-4 (sigma) is needed. The proposed solution is based on a spectrometer placed behind the large-acceptance dipole. 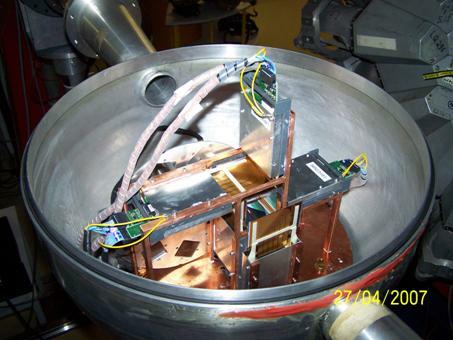 The spectrometer will be placed at an angle of 18º, which is the maximum bending angle of the dipole (5 Tm field integral) for a beam with magnetic rigidity of 15 Tm, and will be operated as a zero-degree spectrometer. The focus at the R3B target is an achromatic focus with a beam spot size of around 2×2 cm2, as in the usual operation mode. The momentum resolution will be obtained by tracking the particles through the spectrometer. The position at the focal plane will thus not be directly related to the momentum transfer in the reaction but rather reflect the momentum spread of the incoming beam. The spectrometer will have an acceptance of ±2.5% in momentum and ±40(±20) mrad in the (non)dispersive direction, respectively. The maximum rigidity of the Super-FRS amounts to 20 Tm in order to allow separation of fully stripped ions also for heavy nuclei. Considering energy-loss in two degraders at the pre-separator and at the mid-focal plane of the main separator, the maximum rigidity of the spectrometer will be limited to15 Tm. The spectrometer will be installed in the Phase II of the R3B project, i.e. the R3B experiment would run during the first two years without the spectrometer. One of the main challenges of the R3B DAQ is to provide a maximum interoperability of the different detector systems and their associated DAQ sub-systems. To this goal, the data acquisition will be based on MBS – a distributed data acquisition system that provides a generalized multi-processor environment, suitable for the readout, control and data storage of heterogeneous setups based on common dead-time or time stamps. The present data acquisition and controls system of R3B/Cave-C serves as precursor and basis for developments for the later R3B experiment. Developments address the automated handling of large amounts of channels in view of e.g. pedestal determination and quality control, combining data acquisition and controls tasks. The distributed data acquisition system is supposed to run in parts in a time-synchronized distributed environment based on BuTiS and White Rabbit with timestamps with pico-second precision and 100ps/km accuracy. The specific front-end electronics together with its digitization part is especially adapted to the individual detector system. As examples (see figures below), for Silicon Strip detectors the AMS front-end electronics has been made available through the locally developped Siderem module. The integrated multi-channel electronics for LAND and NeuLAND is based on the TAC-27 ASIC chip TACQUILA and TRIPLEX card. The readout electronics for a scintillator fibre tracking detector is based on N-XYTER ASIC chip, being integrated into MBS by means of the GEMEX system board. The control, trigger and data flow are susequently interfaced to the common DAQ system. We provide the necessary trigger types, like data, calibration and synchronization triggers together with the necessary dead-time locking in the frontends. For this we also work on integrated logic implementations e.g. TRLOII on the Vulom logic module. AMS Frontend electronics for a Silicon Strip readout for a box, comprising four 640x384 strip sensors close to the reaction target. The system is used for recoil proton detection and tracking onto and from the interaction point on the target. LAND integrated multi-channel electronics based on the TAC-27 ASIC for time measurements with a resolution better than 20ps. The shown system features160 channels QDC, TDC, I²C controlled Discriminators with flexible trigger options (calorimetric, multiplicity, or) and monitoring multiplex outputs. N-XYTER ASIC readout electronics for a HM9500 position sensitive photomultiplier readout for a scintillator fibre tracking detector. The system is operated in vacuum with water cooling provided through a dedicated feed-through flange (lower left).